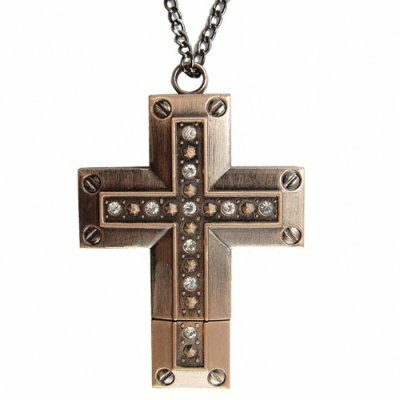 Successfully Added 8GB USB Flash Drive Necklace - Elegant Antique Brass Cross to your Shopping Cart. All metal cross shaped necklace containing an 8 GB USB flash drive. These days a USB flash drive is as necessary as your house keys. Whether you are taking large work files back and forth from the office or are sharing pictures and music with friends, nothing beats the convenience of a USB thumb drive. Well, why not make sure yours fits the person you are? This is a elegant all-metal cross that has a built in 8GB's of memory so you should have space to keep in its heart. Make sure to never forget whats important every single day. 8 GB's of memory is enough to store thousands of documents and music files.